The Female Orphan Home, for the reception and education of destitute orphan girls, was established in 1855 by Joseph Stevenson. In its early years, the Home occupied a number of different premises. In 1861, it was operating as the Home for Destitute Orphans and Fatherless Girls at Higham Hill, Walthamstow. In around 1863, it moved to Schopwick Place, Elstree, Hertfordshire. Then, in about 1869, it relocated to Frogmore House, Frogmore Hill, Rickmansworth. Finally, in 1885, it transferred to Hanworth Road, Tangley Park, Hampton, Middlesex, where it was known as the Female Orphan Home. The Hampton premises were originally built as a hotel, although actually never used as such, and could accommodate 50 girls aged from 3 to 12 years at their date of admission. In commemoration of Queen Victoria's Diamond Jubilee a new laundry and laboratory were added in October 1897. Female Orphan Home site, Hampton, c.1896. Candidates for admission to the Home were considered in order of application as vacancies occur, and those from all parts of the United Kingdom were eligible. They had to be in good health, and between 4 and 12 years of age. Payment was required according to circumstances. Inmates left at 16 years of age, when situations were found for them. 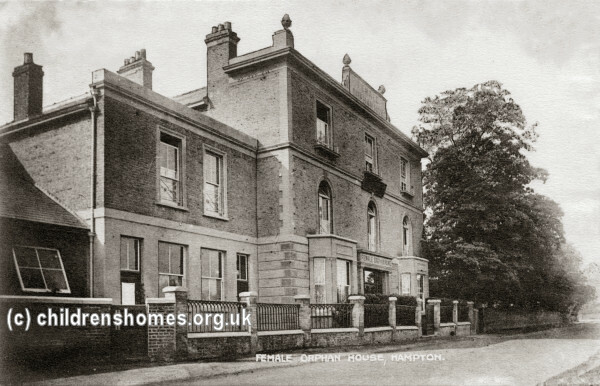 The Hampton Home is believed to have closed in around 1936 and the building demolished soon afterwards.